“Can he jump?” “Small houses! 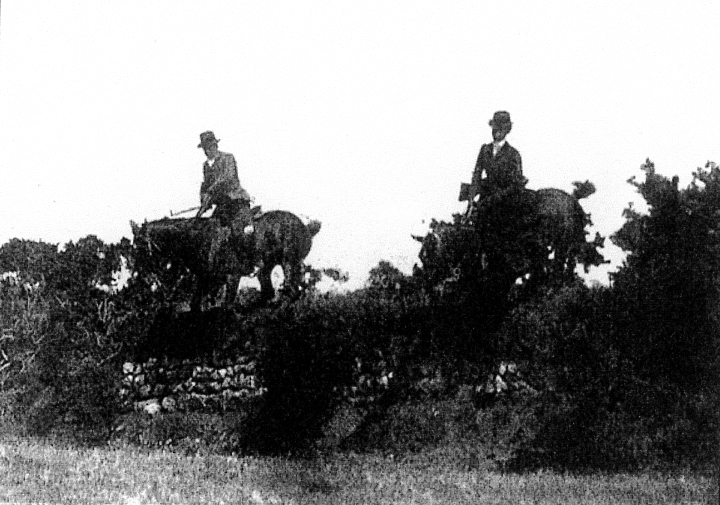 ” Such was the laconic reply of a sporting Tipperary farmer, when asked as to the “lepping” powers of his horse; and, indeed, to cross the country in the wake of the flying pack, with a breast-high scent, and no time to choose a favourable place, one has occasionally to face banks as high as an Irish cabin. It would be hard to find a more all-round sporting country than Tipperary. 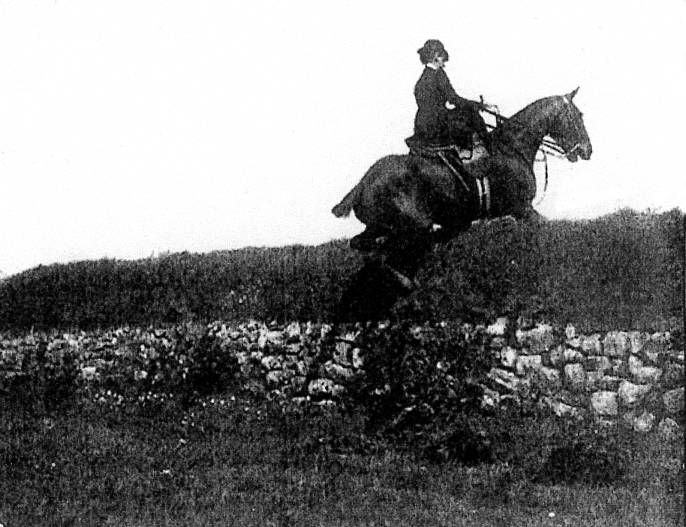 There is hunting every day of the week, for the enthusiastic townspeople of Fethard keep a trencher-fed pack,  which assembles regularly every Sunday morning after mass, and shows excellent sport after hare and outlying fox. 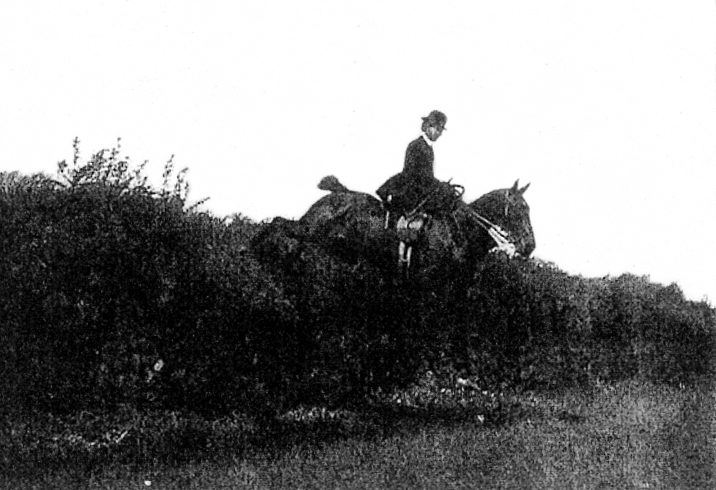 Then Mr. Croome, the well-known steeplechase rider and trainer of many a good horse, amongst others Lord Waterford’s game little mare ‘Grange’, hunts the Clonmel Harriers, which afford wonderful runs after the stout hares for which the country they hunt over is famous. For those who are fond of rough shooting, plenty of snipe and duck are to be found. In summer, when hunting is a joy of the past, one can while away many a pleasant hour rod in hand along the river banks, luring the game brown trout with locally dressed “golden wren” and other equally killing flies. 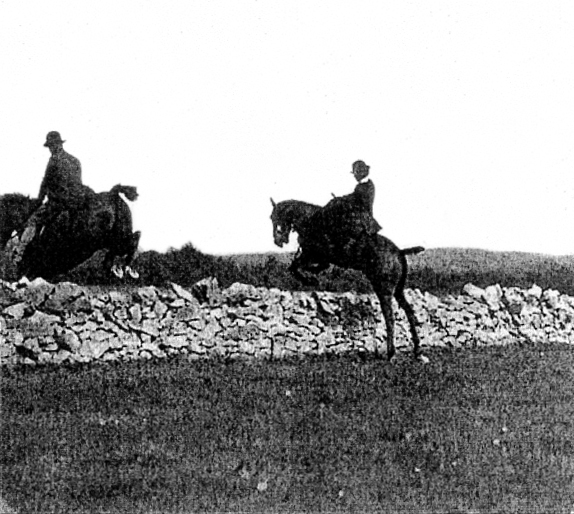 But to “hark forrard.” The popular master, Mr. Burke, has the cream of Tipperary to hunt over; the farms are practically all grazing land, consequently ploughed fields are rarely found, and one can gallop for miles over grand sound grass, intersected by every variety of fence, banks and sound doubles predominating; the exception being the Mullinahone district,  where the big ditches full of water, thick hedges lining the tops of the banks, and deep going, combine to make that end of the county less popular. Also, beyond the river rises the mountain of Slievenamon. Beautiful in its ever-changing colours of misty greys and deeper purple, it is yet a sad stopper to many a good hunt, as far as horses are concerned; for the sides are steep and stony, ravines and bogs have to be crossed, and in the vapours that enshroud the summit one might very easily find it hard to come down again; as a rule, no one attempts to follow hounds except the Master and whips, and they do not enjoy it. We rode up to the cairn this summer, and were well rewarded for the climb. (What condition, by the way, a few such expeditions would put on a hunter! Stretching off in the distance, as far as the eye can see, is a beautiful undulating country, sweeping away beyond Carrick to the Atlantic, westwards to the Galtees,  with grass, nothing but grass to be seen, and the gorse coverts  marked out in a blaze of brilliant gold. A great many of the coverts consist of snug patches of this gorse lying along the hillsides, some being quite unenclosed, all well stocked with foxes. 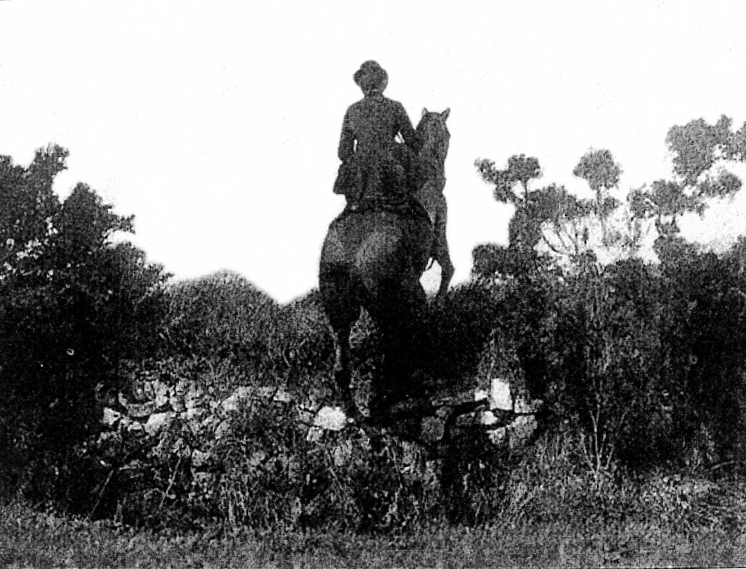 If gorse bushes could grow gramophones,  what “records” they could give to an appreciative audience – the horse coping, each man on a perfect “wonder”, “the best horse he ever rode,” etc. Perhaps later on in the proceedings there is not so much “buck,” when it is noticed that the same “wonder” has been taking plaster casts of his head in the mud. On the other hand, if you happen to be the “coper,” you will learn in five minutes that your steed has every undesirable quality known to horseflesh, so much so that one would really have to breed a 19 hand horse (6ft 4in/193cm) to carry them all. The man who asked his groom why he was such a fearful liar, and got the ready response, “Ah, faith, and why would I be wastin’ the truth on thim,” got the essence of Irish horse dealing character in a nutshell. To get on to the “lepping” part of the programme, however, and thinking that photographs will illustrate better than words the fences one meets and the method of negotiating them, we have taken a series of snapshots, and have to thank ‘Isaac’, ‘Brown Cob’, ’15 Hands’ and ‘by King John’ who kindly consented to jump in cold blood anything required for the benefit of the camera. Very likely most people would say the fences looked bigger when crossed in cold blood than with hounds, but really it is just the contrary. Several fences jumped last season struck us as being particularly big, so when taking these photographs we hunted them out, and rode some of the old lines over again, in all cases finding them much less formidable than we had expected. The only way to account for this is, that when hounds are hunting one must jump, whether one likes the look of a place or not, and cannot take it at one’s leisure. Probably, again, you have several horses thundering down behind you, with the certain knowledge that if you don’t bustle along you will be jostled out of your place or jumped on, and certainly there is no more unpleasant sensation than the feeling that the horse behind has just missed changing on the back of the saddle you happen to occupy – and they don’t always miss! The measurements of some of these banks were taken, from imprint of hind shoe taking-off, to the top of the bank. In changing, a horse digs in his hind feet about two feet from the top of a bank, on the near side, his fore feet occupying a similar position on the far side; the hind legs then follow over and kick back from just above where the fore feet were resting. Notice the different ways of jumping. The lady’s cob is letting himself down to make the jump as small as he can. ‘May Boy’, more flippant, is springing from the top. 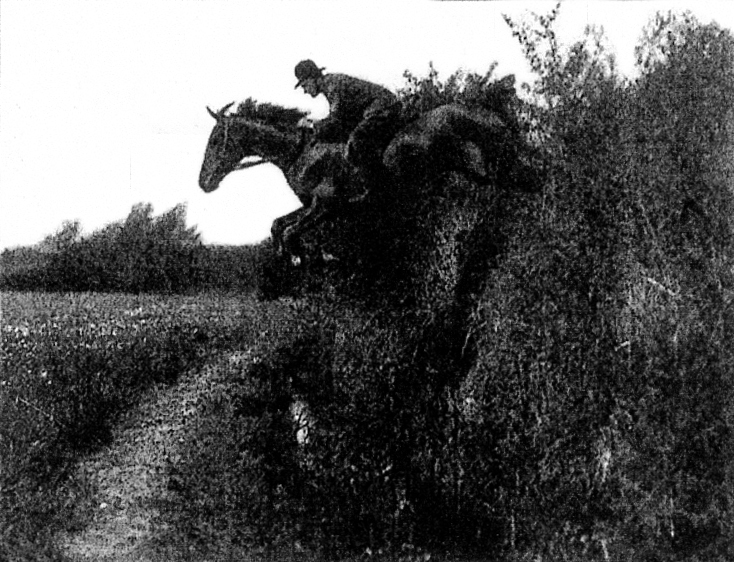 Of course every horse has his own method, but woe betide the rider whose mount is inclined to be too flippant, and attempts to fly these fences without laying hoof to sod. Such a horse will frequently repose wrong side up in some liquid gripe, when, if it happens to be a narrow one, ropes and spades will be in requisition. There are no professional “wreckers,”  as in Meath and other counties, but the “boys” will always turn up “convanient” to lend a helping hand, and greatly enjoy digging operations which have the price of a drink in them. 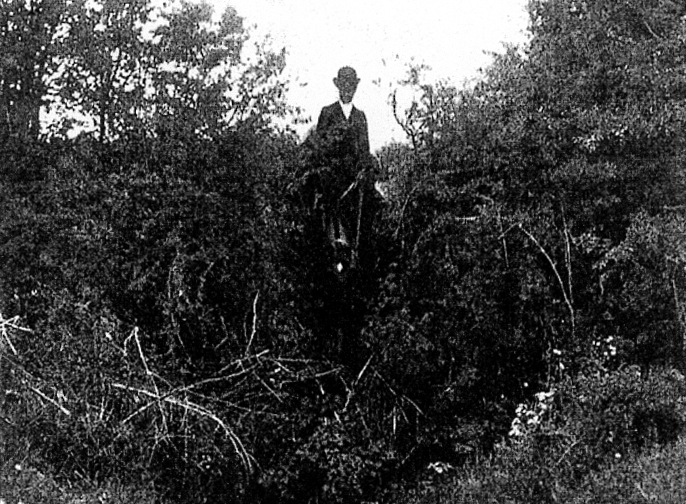 ‘Isaac’, among other qualities, is supremely conceited, and knew quite well that I was “taking his sketch.” It was amusing to see him waiting, ears pricked for the word “Ready,” when, with a light bound, he was on to and over the straightest banks, thoroughly enjoying the proceedings. The native’s ideas of sport are sometimes rather quaint; they like to see plenty of lepping and the “dogs” having a good run at any price. One day our fox, after a short hunt, took refuge in a waterworks drain. An official of the company happened to be adjacent and promptly turned on a goodly supply of water, whereupon a very drowned fox was washed down. Just as hounds were moving off, a native discovered another fox crawling out of the drain, which, with a wild yell of triumph, he picked up in his arms and, hounds making it somewhat lively for him, he bolted to the nearest place of safety, which chanced to be a gate pier; having scrambled up which, he sat on the nearly “quenched” fox, imploring the spectators to keep the Master and “dogs” until the poor “baste” had got his wind again, to give them a run. Needless to say, Brer Fox was allowed to depart in peace. This was a day full of amusing incidents. 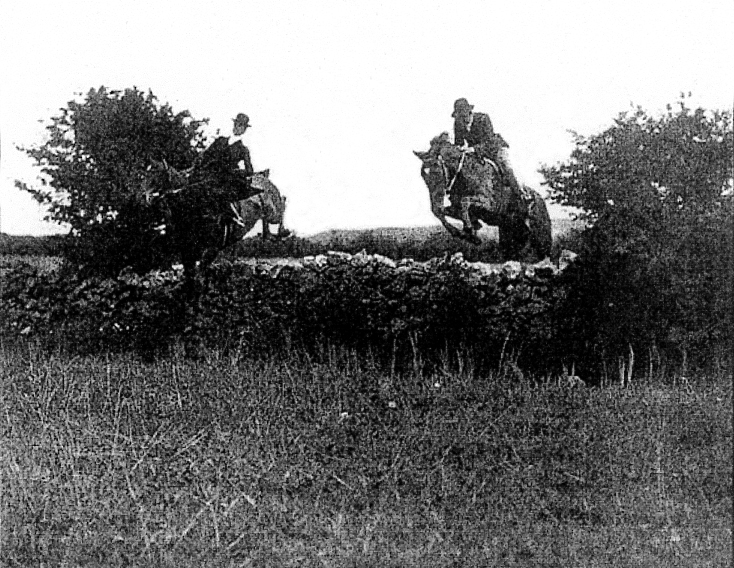 Later in the afternoon we had a good hunt, but unfortunately at an early stage of the proceedings the Master, whips, and most of the field, were thrown out by a wire, a most unusual occurrence. The lucky few who were with hounds when they checked had the somewhat unenviable experience of trying to collect the pack on to the nearest road home. There is no animal quite so exasperating as a hound when it knows you are not the right person to obey. It invariably puts on a most sheepish expression, having discovered which way it is required to go, promptly bolts in the opposite direction, and all the names in the stud-book will only make it lay legs to ground the faster. It was an exhausted field who finally met one of the whips, to their mutual relief. Certainly one requires a clever and handy fencer to be able, when necessary, to turn and walk along the top of a bank, as it is impossible to know what trap awaits one; occasionally it may take the form of a quarry pit, duck pond, or something equally interesting; indeed, one keen follower of the hounds was only saved a nasty fall by the instinct of his horse, which repeatedly refused a bank, his master finally having to choose another place. 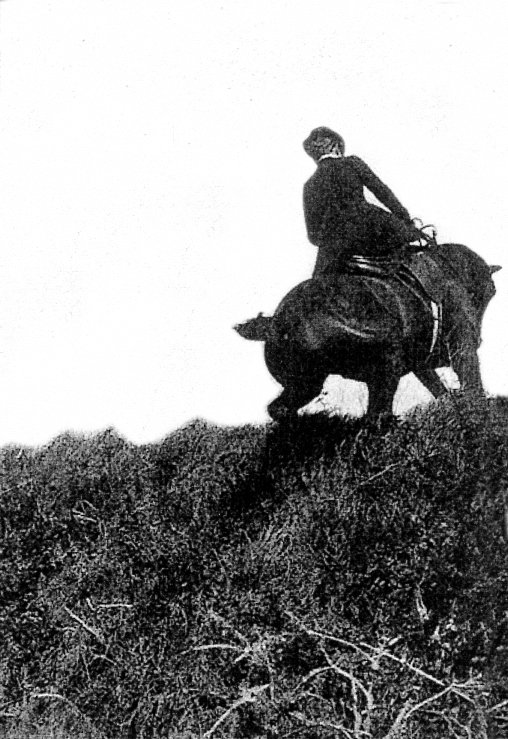 On looking back he saw that where his horse refused he would have jumped over into a quarry. 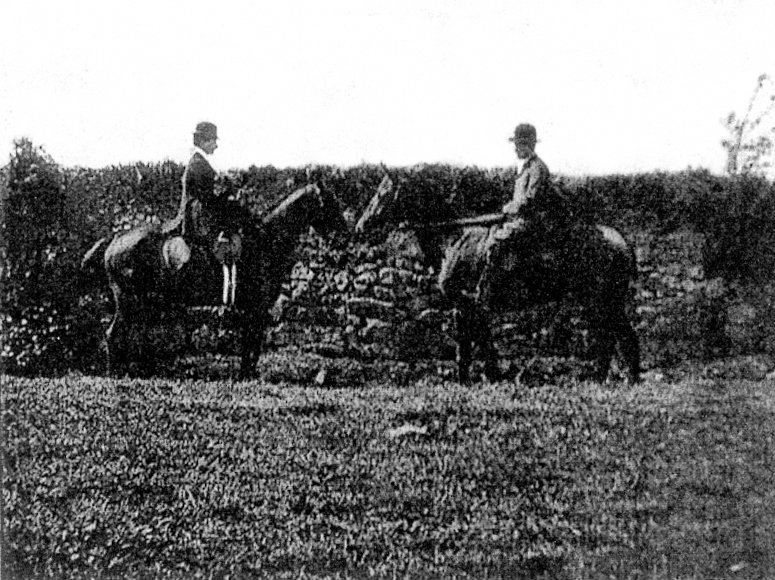 One of the photographs represents a stone-faced bank 9ft.4in. (2.84m) high, a razor-top barely six inches broad, and a dug-out slope on either side. As the hard-riding first whip (who also figures in these illustrations) justly remarked, “The more you look at it the less you like it.” But, fortunately for the field this kind of obstacle is not often encountered. Looking at the fences on paper, cannot possibly inspire the uninitiated with the same awe and respect that one feels when first going at the originals; but, indeed, considering the variety of fences, it is astonishing how few falls one sees. 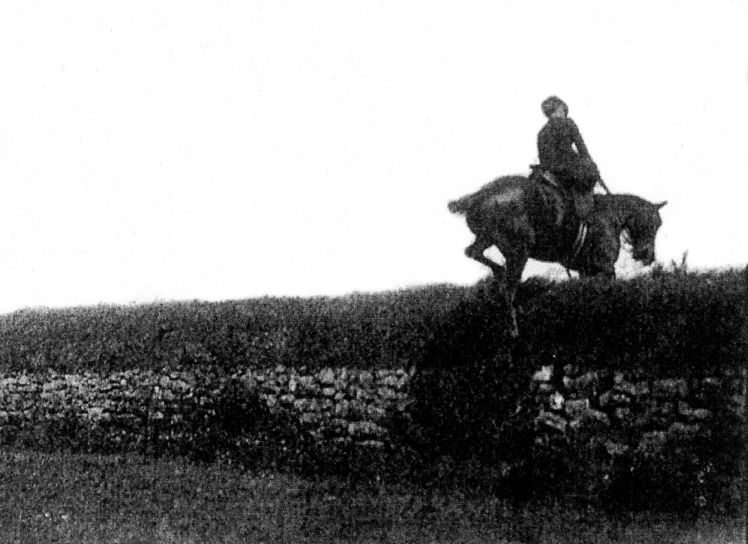 Irish horses have a wonderful way of saving themselves, and seem always to have the proverbial leg to spare. Of course all the banks are not on such a large scale; generally there is nothing to stop a good hunter, but people coming to hunt in Ireland must expect “lepping,” and plenty of it. Mr Burke generally schools across from covert to covert, so that even when hounds are not hunting one gets plenty of practice. Hunting-gates do not exist; occasionally a fine pair of stone pillars are erected but the space between is occupied by a stone wall or stiff pile of thorn bushes. 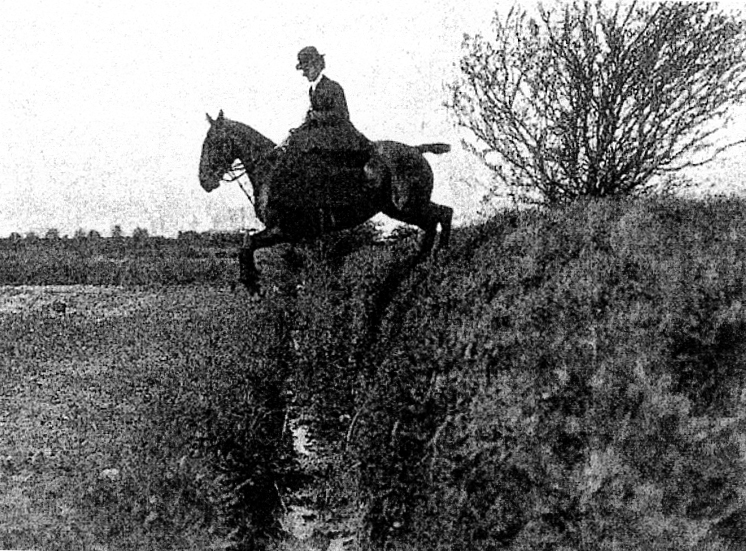 There are few rivers, and these are generally fordable; but I remember one day jumping one, and on looking back saw a lady walking her horse into it, when with a splash they disappeared under water, several others following suit; the river was soon full of horses, riderless and otherwise, gaily swimming up and down. I heard afterwards that at this innocent-looking jump the water was over eight feet deep (2.4m). Talking of rivers reminds me of a gallant incident. 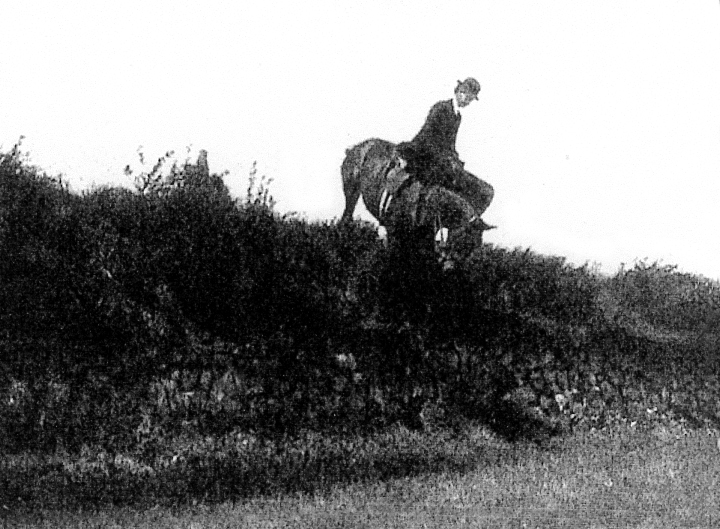 The Munster river, well known for its depth and steep banks, was crossed by hounds in a capital hunt from the celebrated covert ‘Prouts Furze’ over into the Kilkenny country. 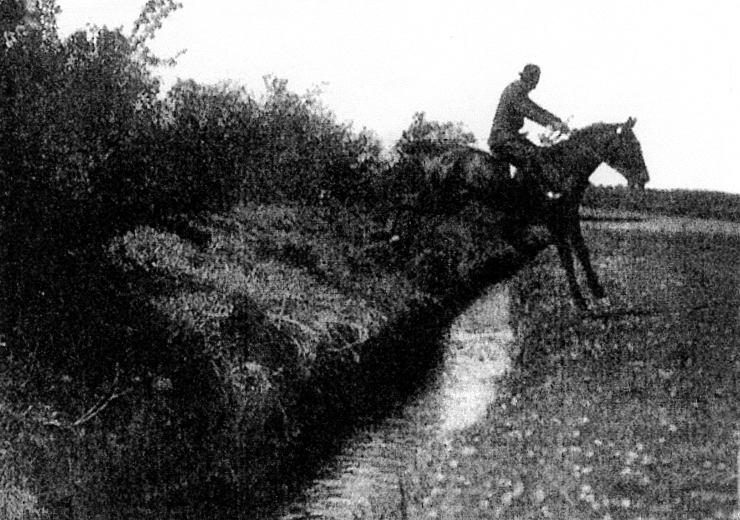 In trying to swim the stream a hard-riding sportsman parted company with his horse. He, however, managed to regain the near bank; but the horse, swept down by the current, was in danger of drowning. 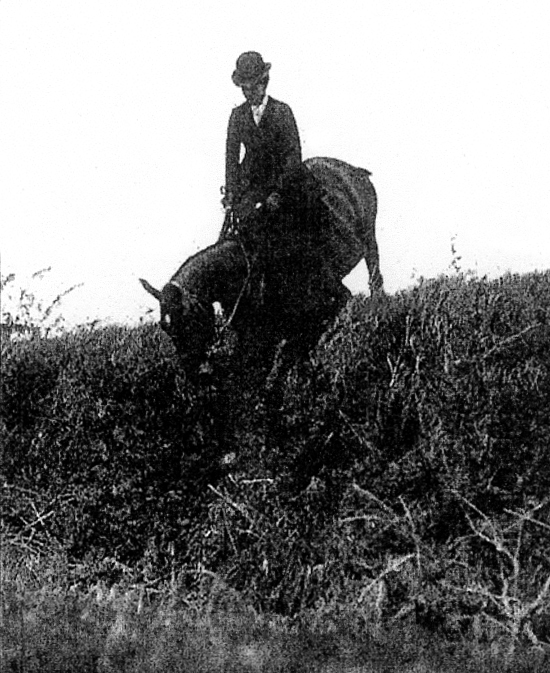 Mr. Jack Poe, on his well-known mare ‘Belva’, first rescued the horse, bringing it safely to the far bank; then, swimming back, picked up the owner, and Belva with her double burden safely landed both on the far bank. 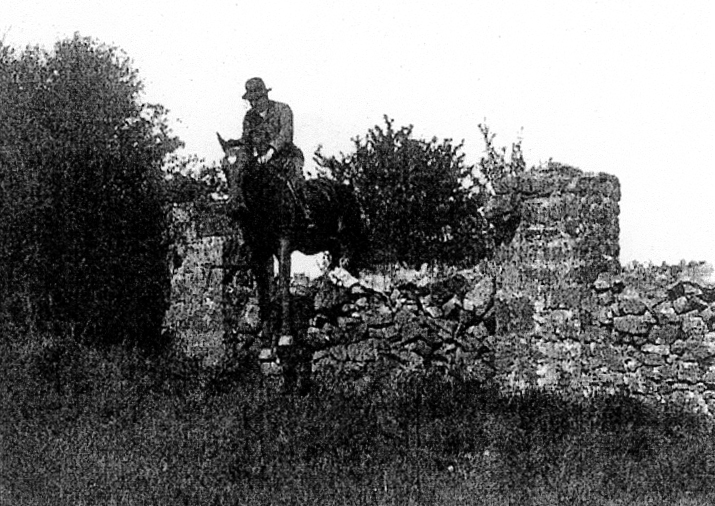 In conclusion let me say that anyone wanting to hunt over this glorious country could not do better than go to Fethard, the centre of the hunting district, where excellent accommodation is obtainable for man and beast. For the benefit of other amateurs who might like to try their hand at this most interesting branch of photography, let me add that these illustrations were taken on the Kodak Company E.R. “Seed” plates, exposure one six-hundredth of a second. ‘All on’ – All hounds present and correct. ‘Cast’ – What hounds do at a check. It is the action of seeking to recover the line they have been hunting. ‘Check’ – A check in the hunt is caused in the temporary loss of the scent. ‘Couple’ – Hounds are always counted in pairs and there is always a half couple for luck. ‘Cry’ – The sound hounds make when hunting. ‘Curdog’ – A dog which is not a hound. ‘Den’ – Where a fox lives. ‘Draw’ – Where hounds enter a covert and look for a fox. ‘Earth’ – A foxes burrow. ‘Field’ – The group of members and guests, excluding the Master, huntsman and whippers-in, gathered to follow hounds on any particular day. ‘Field Master’ – The person who is responsible for the field while out hunting. ‘Full Cry’ – When all hounds are speaking together. ‘Mark’ – When hounds hunt a fox into it’s den. 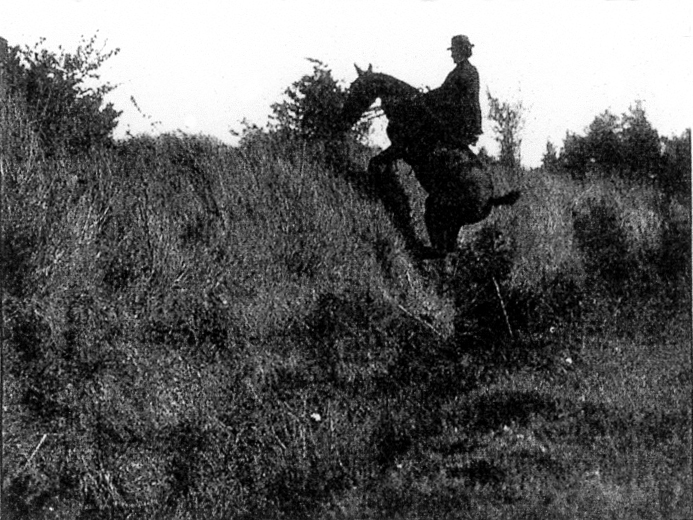 ‘Point’ – The point of a hunt is the longest distance in a straight line. This starts from where the fox leaves the covert to where it goes to ground. ‘Tally Ho’ – What we say when a fox leaves a covert. ‘Wire money’ A payment in addition to your subs, which goes into fixing walls knocked down and wire cut. ‘Too warm for scentin’ – the air next the ground is too warm and the scent has risen off the ground and is above ‘nose height’, generally if a rider can smell the ‘aniseed’ then the hounds can’t. ‘Too cold for scentin’ – the cold air has pushed the scent into the sward/bracken/heather and the hounds have difficulty smelling it! “Good morning/ afternoon” to anyone on foot, in their cars watching, hanging out of windows, gardening etc…to be friendly and dispel the myth that we are all stuck up hoorays who ride rough shod over everyone. Hounds don’t bark – they speak. Hounds don’t have tails, they have sterns. If someone has their hand behind their back with the palm facing outwards and fingers splayed, it means they are slowing down. This warns any half-wits not to cannon into your horse’s rear end at Mach 9. A Red ribbon on a horse’s tail is a warning that a horse is a kicker. 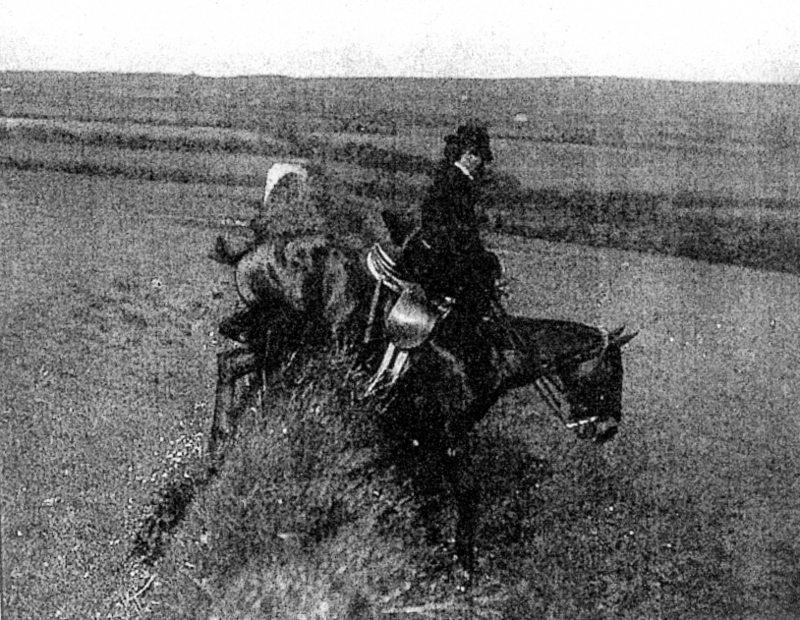 Other riders should be careful not to crowd the horse, especially from behind. A Green ribbon means that a horse is inexperienced and likely to misbehave. This is suitable for young horses or for horses who have a particularly nervous disposition. Horses with red or green ribbons must stay at the back of the field. 1. A “trencher fed pack,” was a pack of hounds kept individually by hunt members and only assembled on the day of the hunt. They were fed a diet of table scraps and kitchen waste. A trencher was originally a flat round of bread used as a plate, upon which the food could be placed before being eaten. At the end of the meal, the trencher could be eaten with sauce. 5. Covert is a patch of woods or brush where fox might be found. To use a gramophone you wound up the spring with a handle, inserted a new steel needle into the tracking arm, put the record on, carefully placed the arm on the lead-in groove of the record, released the brake, and the sound would emerge from a horn, or through an internal mechanical sound-box. The needle would only last for a few records and then it would have to be replaced. Needles were sold in small tins about the same size as a matchbox. A record would hold about three minutes of material on each side and the turntable revolved at 78 rpm. Early disc recordings were produced in a variety of speeds ranging from 60 to 130 rpm, and it is not clear why 78 rpm was chosen for the phonograph industry. Apparently this just happened to be the speed created by one of the early machines which allowed a similar playing time to the Edison Home phonograph cylinder player. Later developments introduced 16 rpm for voice recordings, 33 rpm for music recordings – this was a 12 inch (30 cm) format developed by Columbia Records in 1948 and known as the LP or long playing record. The 45 rpm record developed by RCA Victor in 1949 was a 7 inch (17.5 cm) format. 7. To catch sight of something difficult to see. 8. 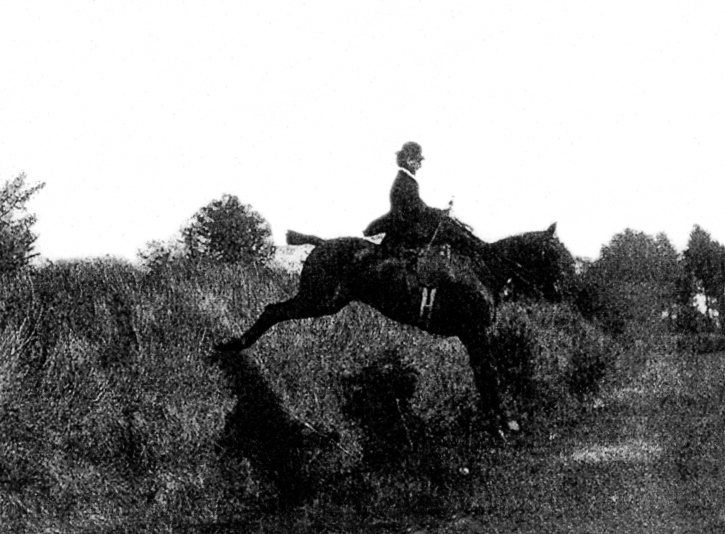 The phrase ‘tally-ho’ is a largely British phrase, which originated from the activity of foxhunting, and other forms of hunting with hounds, shouted when a rider or follower sees the fox. 10 Munster river flows into Kings river in the townsland of Earlsland west of Callan which is 20 km from Kilkenny.